The FLASHlite Magna™ LED Dental Curing Light is a cordless, light-emitting-diode (LED) curing light for the polymerization of composite and adhesive restorative materials containing the photo-initiator camphorquinone. The pen-style unit is 22-cm long and weighs 121 g. It contains three LED lights and has an average output of 1500 mW/cm2 over the entire 11-mm beam providing 1,425 mW of total power. The FLASHlite Magna LED light has a wavelength range of 440-490 nm. The manufacturer recommends five hours to fully charge the lithium-ion battery when new or fully discharged. A full charge is indicated by a visible green light and lasts for approximately 30 minutes of use. During operation, an audible beep is heard every five seconds and after 20 seconds, the light automatically shuts off. The FLASHlite Magna is supplied with the lens cap attached as well as a charger base with a built-in radiometer, AC/DC wall plug adapter, one replacement lens cap, an amber light shield, a multi-tiered hardness curing disk, and operations manual. Disposable tacking tips are available and are sold separately. 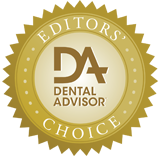 FLASHlite Magna was evaluated by 15 clinical consultants in over 680 uses to cure adhesive dental restorations. This product received a 92% clinical rating. The FLASHlite Magna received the highest ratings for light intensity and beam width as well as portability of the unit and ease of use (on/off). Thirteen out of 15 consultants answered yes when asked if they felt the FLASHlite Magna was a good value compared to other LED curing lights. The pen style of FLASHlite Magna provided good access to most areas of the mouth, but some consultants commented that they preferred a pistol-grip light with a thinner neck and swivel tip. The light is very intense and can produce heat that is noticeable to the unanesthetized patient. Seventy-three percent of consultants found FLASHlite Magna to be equivalent to or better than their current LED light. Sixty percent of our clinical consultants would switch to the FLASHlite Magna LED Dental Curing Light and 80% would recommend it to their colleagues.